As mentioned in my previous post, today my colleagus and I presented at the Virtual Worlds Best Practices Conference in Second Life about our 6-week online teacher training session Virtual Worlds & Language Teaching. Many of our VWLL participants were present and supported us and I’d really like to thank them for this and for being such active participants during the session. Although it was announced as a roundtable, it was more a presentation with a Q&A session at the end. We had many positive comments from the audience and it was obvious that there was interest from the questions we received. However, we did not have a discussion about language learning/teaching in SL or more specificially about teacher training in SL. I don’t know whether this was due to time constrainsts or whether participants needed time to digest what they had seen and were told. Maybe we, the presenters, could have asked some questions back to the audience. This will be something that I will think about before our next presentation. The session has finished and the presentation is over but the VWLL community in our Ning and in SL is still vibrant and interested language teachers are welcome to join. 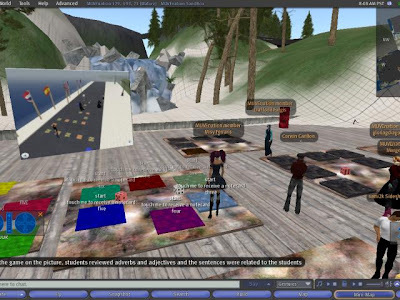 In January/February, my colleagues Dennis Newson, Graham Stanley, Nick Noakes and I moderated a 6-week online session for language teachers on Virtual Worlds and Language Learning. We are now presenting the outcome and discussing it with the audience at the VWBPE conference.Our roundtable is scheduled for Sunday, 29 March 6am SLT/PST (1pm GMT – your time zone) on ISTE island. There are many interesting keynotes, presentations and workshops. Read the official press release below for for information about the conference. ARE VIRTUAL WORLDS THE CLASSROOMS OF THE FUTURE? 2009 Virtual Worlds Best Practices in Education Conference (VWBPE) Bringing together Educators from around the World in Second Life®, March 27-29. March 17, 2009 — Virtual world educational environments may not replace real classrooms (yet), but they are becoming integral to the future of education, say the organizers of the 2009 Virtual Worlds Best Practices in Education Conference (www.vwbpe.org) to be held in Second Life®, March 27-29. Conference keynote speakers and panels will focus on how virtual world environments can help today’s learners become all they can be and build the work force of tomorrow. The three-day conference will be an opportunity for virtual communities from around the world to showcase projects, courses, events, and present research that lead to best practices in education. From presentations on the architecture of designing a virtual classroom and campus to projects that engage middle school students with math, science and languages to the award-winning 3D-Wiki technology created in Second Life used to design a medical clinic in Nepal, the VWBPE conference is dedicated to furthering the creation of innovative, interactive and immersive environments. Keynote speakers (see attached list) and panelists for the conference represent a wide range of institutions, leading universities as well as K-12 school systems that use Second Life ® as part of their educational programs. The Virtual World Best Practices in Education (VWPBE) conference originated from the 2007 Second Life® Best Practices in Education Conference. Educators are one of the most vibrant and growing groups in Second Life® with an outreach to more than 6,000 SL residents. To register, please visit: http://vwbpe09.eventbrite.com Registration is free to all conference attendees. 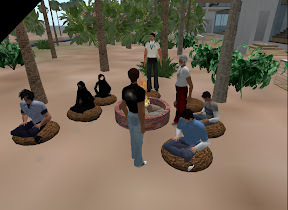 One of the many ways that Second Life can be used for learning and teaching languages and maybe one of the most authentic ways of learning and practising the target language are intercultural meetings. 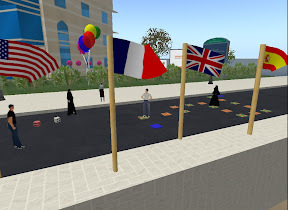 An English teacher from Dubai and a Second Life colleague of mine, Chris Surridge, from Korea have recognised SL’s potential for this very early and came up with a wonderful intercultural project that culminated in a Second Life meeting of their students. Chris repeated this project and linked his students with other cultures after the first successful meeting. A couple of weeks ago, the topic of Muslim women in SL came up in the SLED list. Somebody was interested in how Muslim women from more traditional cultures were using SL and how their SL lives might reflect back into their RL lives and vice versa. I had several English students from the Middle East in my SL course and know some others from the Muslim community in SL, so I replied to the request. Several other educators who read this message contacted me to ask whether they and their students could meet me and other Muslim women in SL to talk about their lives and career choices and how similar or different they are in SL and in RL, what Islam means to them and why they wear hijab (the Muslim headscarf) in RL and/or in SL. I thought this was a great opportunity for my former students to practise their English with an authentic task and a topic that I knew would interest them. So, I asked and they agreed to meet with the educators and their students. The first of these meetings with a professor at a university in the US and her Spirituality and Human Behaviour students took place today. Unfortunately, none of her students logged in with their avatars but the professor’s screen was projected so that all students could follow the conversation and ask questions through their professor. There were around 6 Muslim women from the US, Egypt, Syria, UAE and Qatar, and I, of course 🙂 We also had a lady who was not Muslim but dressed like one because she was interested in Islam and a lady from France who was also not a Muslim but belonged to the same Muslim community (Ummah of Noor) which is open for everybody to join. The meeting took place on the Islamonline dot net SIM which shows a replica of the Al-Haram and the Ka’bah in Makkah, the holiest place for Muslims. The meeting officially lasted one hour and the conversation was extremely lively. Although, this was more an ad hoc, one-off meeting and we had no opportunity to meet the students from the US and have deeper discussions (it was more a Q&A session), the students watched and “listened” very intently (according to the professor) and the Muslim ladies replied to the questions in length and with much enthusiasm. It’s a shame that the discussion board where the US students will continue to discuss this topic is closed to the public and we cannot participate. With a little bit of preparation and more time, these kinds of meetings can be transferred into real learning opportunities for both sides which go way beyond learning for a subject. How much more authentic can learning become? This is where technology does not get into the way of communication but makes it possible. How else could a group of students from the US have met Muslim women from so many different countries so easily to learn first hand about the lives of these women? 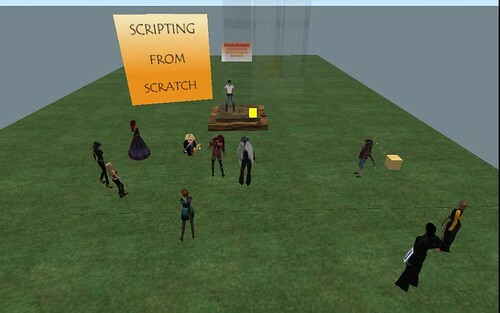 Are you ready to teach in Second Life? Are you planning to teach in SL? Do you have the skills it takes to be able to do so? Chris Collins or Fleep Tuque in SL, a very experienced SL educator, has shared her first draft of a teacher “self-assessment” quiz “to help faculty determine if they’re ready to bring students in world” and asked other SL educators for feedback. On the SLED list, she points out that: “It’s not meant to be an exhaustive test of competency… but more in the spirit of those “personality tests” that give you a sense of where you fall in a spectrum.”Chris says she used the Global Kids Second Life Curriculum (an excellent resource!) as a guide for this quiz. In the the feedback received from the SLED list and Twitter, some asked questions like “does one really need to be able to manage land in order to be a good SL teacher” or “just because I don’t have anything in my picks tab does not mean I don’t know how to do that”. a) have the students sit in your virtual classroom and lecture about the topic? b) invite an expert who gives a slide presentation? c) have students find out about different religious themed places in SL, take snapshots, come back and report to the class? d) have students do c) and meet SL residents who subscribe to different world religions, interview them and then, create an interactive exhibition? Chris is revising the skills tests (and also looking for a new home for the quiz). I think the test is a brilliant idea which gives educators a quick overview of what SL skills they need and where they are standing. I hope she’ll add some pedagogical questions to it or even better device a separate quiz for that purpose. This might even be a collective SLED list educators’ effort. Nergiz Kern learns to teach in a virtual world. ‘I don’t even have time for my first life and certainly can’t handle a second life’ is typical of the statements that I hear from sceptical teachers. Well, I don’t lead a second life either, but Second Life (SL), the three-dimensional virtual world is very much part of my first or Real Life (RL). It is one of the tools in my repertoire that in many ways closes a gap and, in some instances, enhances my classroom practice. It has now become very much a part of my professional development. At first, I was intrigued by what I heard SL had to offer to learners and teachers. I am a visual learner with an interest in technology and the internet. As a teacher, it was the immersive and collaborative nature of SL that appealed to me. I had also been looking for motivating ways to teach online and the game-like nature of SL seemed to be one such way. Consequently, I signed up for SL, created my avatar, the figure who represents me in SL, and started exploring. Once I had decided to start teaching, I needed students for my first SL English course. Finding students is a relatively easy task in SL because many learners are less sceptical than teachers, and many sign up to SL because they want to practise English. If you offer free classes, you will have no problem finding volunteers. Fourteen students signed up for my course but only around eight to ten of these were regulars (not all of them came to every session, though). They were from Turkey, Egypt, Saudi Arabia, Qatar, India, France and Germany. Some were experienced SL users, others had just joined. Basically, you can use all the places within SL to teach (except, of course, any inappropriate ones with mature content). It is actually a dream come true because instead of just looking at pictures of remote places, hotels, restaurants, sports, etc and pretending to be there, teachers can actually ‘take’ their students to these locations in a matter of seconds. This is called ‘teleporting’. It is an advantage, however, to have a meeting point where the lesson starts and ends. This should be a place where teachers have the right to ‘rez’ objects (take items such as presentation screens, whiteboards, chairs, realia, etc out of their inventory and place them in the location so that they can be seen and used by everybody who is present). Our meeting point was a garden where I had my presentation boards, some chairs and a lot of space to move around. For groupwork and discussions after field trips, we also used my own house in SL, which is divided into two areas so that people in one room cannot hear those in the other, and no one can be heard from outside the house. I decided to offer a pre-intermediate general English course as the majority of the potential students I had talked to were at this level and already had enough knowledge of the language to be able to follow a course where they would not see their teacher face-to-face. In the end, I had a mixed-ability class, with students ranging from elementary to intermediate; I didn’t turn down any student because it was a trial class and they were very eager to participate. It was a six-week course, with two 90-minute sessions a week on Wednesdays and Saturdays. The synchronous ‘face-to-face’ lessons took place in SL. In addition, I used Moodle for homework assignments, to make resources (vocabulary lists, slides, additional exercises, etc) available after class and for discussions and questions. As SL has a game-like nature, I wanted to make homework interesting and varied, too. So I selected online games to practise vocabulary and grammar, and used voice-recording tools for further speaking and listening practice. Whenever possible, I gave students the choice to submit their homework either in writing (blog posts) or in spoken form (recorded), depending on what they thought they needed to practise most. In order to decide what to teach, I looked through my material and notes of past lessons for this level and browsed through some coursebooks to see what topics, skills and structures they covered. I wanted to have a mix of topics, structures, skills and activities to make it interesting and relevant to the students, but also for me; I was keen to try out different things to see whether or how they worked in SL. I also knew what kind of difficulties students from the participants’ countries usually have. However, I didn’t plan all the lessons prior to the course; I left myself free to be able to base some of them on the needs of the students. I would only discover these needs once the course had started. I adapted materials, games and activities to SL where possible. Sometimes, this was easy (eg finding pictures for a topic and uploading them to SL to show on a slide/PowerPoint projector or picture board). I found that activities such as ‘twenty questions’, short dictations or board games, and pair- and groupwork were also possible in SL. One style of activity that did not work, however, was mingling. Although SL offers three-dimensional sound (people who are closer sound louder than those further away), students have to move much further away from each other than in real life, otherwise voices get completely mixed up. As a result, they ended up taking turns in pairs, with the others listening. I had a whole range of tools available thanks to generous experienced SL educators and programmers, who usually give them away for free. Tools I used in this course were: a presentation screen for slides, picture boards, a board that displays notecards/text, a timer, and objects that automatically hand out their content when touched (eg notecards with instructions or homework). What I missed most was a whiteboard that I could write example sentences or draw on spontaneously (now there are some tools that make this possible). Writing words or sentences can be done in the chat area or on notecards and then displayed, though they aren’t in colour and there is no way to highlight things (except by using asterisks or capital letters). However, drawing is not possible at all without prior preparation of slides. 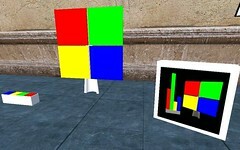 I discovered that there are also, however, things that are possible in SL but not in RL. I tried to capitalise on these as much as possible. Most lessons took place ‘outdoors’ and we went on many field trips. Corrections could be done in text chat or with private instant messages without interrupting the students or putting them on the spot. Text chat (and even voice chat) could be saved for review and vocabulary work or given to students who missed the class. I soon realised that more rigorous planning is needed for SL lessons than for RL lessons, and that preparation in general takes more time because you cannot simply point at the coursebook. The lesson plan has to be written, pictures found, vocabulary, example sentences, grammar explanations and homework instructions written. Once you are in SL, pictures and slides have to be uploaded, the inventory folder needs to be organised: tools, notecards and slides have to be named appropriately so that they can be found easily, places to go have to be selected, etc. After planning a couple of lessons and teaching the first sessions, I found that my lesson planning was taking a long time, partly because I was thinking in terms of RL and trying to transfer those lessons into SL. Sometimes this was justified, but often it was possible to be more spontaneous, using different activities and tools that were available to teach in a more SL-style. To give one example, instead of showing pictures of objects, it is possible simply to drag them out of one’s inventory. So, all kinds of realia (including such objects as houses, airplanes, animals, etc) are instantaneously available in the ‘classroom’, not in two dimensions, but in three. Fewer uploads of pictures also means less money spent as each upload costs ten ‘Linden dollars’, the currency of SL. This is not a lot of money (at the moment of writing 266 L$ = 1 US$) but it can accumulate. On the other hand, you do not have to make any photocopies, so you are saving money there. Again, given the game-like nature of SL, I wanted to make my lessons fun and interactive. Interactivity and student-centred lessons in SL are even more important than in RL for several reasons. Firstly, most people in SL are there because they want to have fun and they want to do things, not just listen to somebody. Secondly, we may meet synchronously at the same virtual location but, ultimately, everybody is sitting at home in front of their computers. So, the teacher cannot see who is listening attentively and who is nodding off. Keeping the students active and having them move around, teleport to different places, form groups, etc and getting them use voice as often as possible, will make sure they are not in the kitchen preparing food while their avatars are the only ones ‘listening’ to the teacher! Each lesson was self-contained as I could never be sure who and how many would attend the following session. However, some of the lessons were still connected thematically (eg a lesson about news, practising asking questions, interviewing peers, interviewing a guest, watching a presentation, giving a presentation). We took two field trips where one student was the tourist guide and showed the tourists (all the other students and the teacher) their favourite SL location. Another field trip was to Reuter’s SL office. We played word, board and other games to practise and review previous lessons. In one lesson, students had to build objects following instructions; this practised the names of shapes, colours, prepositions of location, and how to give instructions. We had a guest speaker for the students to interview. I also set up flags of different countries along the street to practise country and nationality names. We sat together in my living room to talk about our trips and to tell stories that the students had written in groups (using realia that I had placed on tables). And finally, we had a graduation party with virtual food and drinks, games, an exhibition of what students had built for homework, lots of laughter and chat in English, and, of course, framed certificates of participation. You can find detailed downloadable lesson plans, post-lesson evaluations, student feedback, tips and pictures taken during the lessons on my blog: http://slexperiments.edublogs.org/. The students didn’t have to pay for this course, but I asked them to fill out feedback forms after each lesson and at the end of the course. This student feedback was immensely helpful for me in planning future sessions and finding out what works and what doesn’t. I was amazed how well they were able to reflect on their learning in the lessons (most came from rather traditional educational backgrounds). All felt that their English had improved and 60 per cent thought that SL lessons were better than RL ones. Eighty per cent said they would participate in another SL English course, with the remaining 20 per cent saying that they didn’t know whether they would or not. There was no one who said they would not participate again. This was a wonderful experience for me and I am excited about the possibilities virtual worlds have to offer. The class was for me as real as in RL and the students said they felt like a real class, too. I was very happy to see that they also met outside class and talked with other in English. The sessions were exhausting at times and we had a few problems (time lag, crashes, etc) but nothing that affected the lesson too much. After all, things can go wrong in RL classes, too! However, people are usually more critical of new tools and see mostly what is lacking rather than what they can add to our teaching practice. Can you survive as a teacher without SL? Sure, you can; at least for a while and maybe if you teach in an English-speaking country where your students can immerse themselves in the language by stepping out of the door. However, if you are in a non-English-speaking country or have distance students, SL can add a lot to your teaching. SL also offers many opportunities for students to practise their English informally outside class time. They can visit different places and immerse themselves in the language without leaving their homes. This is a huge advantage for those who cannot study abroad, for financial or other reasons. It gives distance students a feeling of presence and really belonging to a group. SL may be a good tool to get shy students more active as it is their avatars speaking or writing in English and not them. It also offers something for different types of learners. Teachers do not need to offer complete lessons in SL. In the course of face-to-face classes, they can pop into SL for short sessions, project work, an interview, to demonstrate something or to take a field trip. This can even be done as a whole class with one computer and an interactive whiteboard. Teachers who do not want to or cannot use SL in class, can still set homework (providing all the students have access to it) asking them to interview people about something, do some research and write a report about places they visited or do SL quests and scavenger hunts. It is predicted that all the internet will be three-dimensional in the near future. So teachers and their students who use SL are picking up a real-life skill. I will certainly continue teaching in SL or other virtual worlds and can only encourage other teachers to do so, too. Please contact me if you have questions or need help to get started. This article was first published in English Teaching Professional, Issue 61 March 2009. This is by no means a complete list but what I have collected through attending in-world workshops, chatting with experienced workshop instructors and adding a bit from my own SL teaching experience where appropriate. I have not numbered the lists because the factors are not in a particular order and there is no specific number of items. Also, this is related to SL skills workshops. Other types of workshops, seminars or lessons will call for partly or completely different approaches. Detailed/accurate instructions and supplies prepared in advance and handed out at the beginning of the session. The folder should include all the material needed, like textures, scripts, and sounds, slides, but also a notecard with the instructions so that latecomers or those falling behind can catch up (Copyright: This might lead to the instructions being used by others for their workshops but they can be copied from local chat anyway. Limit the number of participants to be able to be able to provide sufficient individual help. Picture/slide or in case of building, a finished version of the object that participants are going to build placed visibly. Improving/adding to instructions (clarification about questions asked during a session can be added to the instructions for future session. Interesting topic (obviously there isn‘t always a choice but even though the learning aim might be fixed, like „basic building“, „how to build a box that hands out content“, the instructor can make it interesting and timely „Gift box building“. Spacial design: In most building workshops, the space seems to be designed very traditionally with neat rows for participants (though often with cushions instead of desks and chairs) and instructor sitting/standing in front facing the group. This means, the instructors have to shout instructions. Asked whether it has any advantages, I was told that it didn‘t. I discussed other options with instructors: A circle of a 20m diameter would eliminate the need to shout. On the downside, some students would face the instructors back and and would need to use the camera controls more to see the slides used for the class. A semi-circle might be the best option. Start punctually but plan activities/workshop in such a way that latecomers can catch up with the least disruption. Agree on and display (slides) rules of conduct for such cases (and also on how you intend to deal with questions, etc.). Especially in beginner workshop, provide visual/textual help with SL user interface (e. g. how to zoom in on slides, use camera controls). Most instructors, I was told, copy/paste instructions from notecard that has been prepared in advance (see planning and preparation). Although, this is already a much better solution than typing instructions life, I use a tool like the SpeakEasy HUD instead of copy/paste. The HUD automatically brings up the next step of the instructions typed in advance in a notecard with one click on its icon eliminating the need to have a separate window with the text opened. The HUD gives me enough flexibility to react to questions during a session or add personal (live) remarks to not make it feel impersonal. Show slides instead of trying to describe things in text. A combination of both is probably the best to cater to the needs of different learner types. Use slides and other means to show/tell first what participants are going to do next and then do it. This gives participants a sense of direction and confidence. Show the final product(s) and explain or demonstrate what it is good for and when it is used (knowing the purpose of what is being done. Make the different steps visual (slides of steps or instructor building the object together with participants) so that participants can check whether they have done steps correctly. When using slides, make sure the rez quickly (e. g. by pre-rezzing them on a small prim or using presenters that have this feature built-in). Keep to the subject/topic (e.g. if a class is about basic scripting don‘t lecture about the history of programming) Participants usually want to to do something and have something to take away. If too many participants have problems and need help, it is good to be able to call another instructor for help. Even better would be to always have a ”helper” there who help with technical or similar problems. After such a session ”problematic” session, it is important to analyse why the problems occurred and try and eliminate the cause as much as possible. Personalize activities whenever possible even if it is simple things like choosing ones own textures, sound, text or colour. Conversational flow/Communication dynamics: Allow participants to interrupt, ask questions and react to comments by them whenever possible during the session to make session less stressful and more light-hearted. Especially when the instruction text has been pre-prepared, it can sound very impersonal if nothing else is ”spoken”. Also, these mini-chats give those who have fallen behind a chance to breathe and catch up. This will create a positive atmosphere and lower the affective filter and thus enable better learning. Whenever possible and if the nature of the workshop and time allows, allow participants to reflect on what is being done. A pure step-by-step instruction on how to build something or script might be time-efficient if only the result is important but will not result in real learning. For learning to take place, participants need to think about the process and reflect on their learning (if not possible during the workshop than outside of it by providing learners with questions). Decide which questions to answer in local chat and which in IM (If one participants asks a question, replying in local chat might confuse others. However, even if a question has been asked in IM but could be relevant for all, it should be answered in local chat). Monitor students‘ progress by asking how they are doing after major steps and if possible, by looking at their builds/objects and trying out if they function as they should. Assessment depends on the nature of the workshop and what the expected outcomes are (An object with certain looks or function or a script can be assessed by their looks, accuracy or trying if they work. The process might also be taken into account. In other workshops like ”how to best use communication tools“, assessment could be by level of engagement, correct etiquette or relevance and nature of contributions), collaboration might be assessed if that was a requirement or completion of a task or solving of a problem. Recapitulation is important at the end of a session for better learning to take place. I haven‘t seen this done in any of the workshops I have attended. In my lesson, I always plan to show the sign-posts from the beginning of the lesson again to help recap but often run out of time and can‘t do it. Provide access to a network and/or forum where participants can help each other in between sessions. 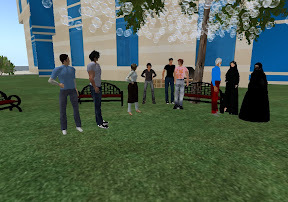 I use Moodle forum and created a Second Life group for my students. Provide additional help, material, exercises and information after the class. These could be accessed in-world or on the web. I use Moodle (for chat logs, vocabulary lists, other material) and web 2.0 tools (for exercise, self-paced practice). The instructor of the scripting workshop I have attended, Simon Kline, provides video tutorials of the topics covered in-world. Motivation: Providing a forum, in-world group and creating a network can also be highly motivating. Another way of motivation participants is to showcase their ”products“ and success stories. In my course I did this by making an exhibition of students‘ builds, a party at the end and framed SL certificates. The scripting instructor mentioned above compiles some successful stories of his students. Note: It is important to keep in mind that this list of some key factors is for hands-on workshops like those for learning about basic SL building and scripting. Workshops can take very different forms and factors affecting success will vary and not all of the above will be suitable. A lot also depends on whether the workshop is one of a serious or a stand-alone one, whether participation is compulsory or voluntary and other such factors. I found the workshops I have attended interesting and learned new skills plus took away a finished product and scripts and knowledge that I can use/apply for other tasks. I found one of the building workshops a bit stressful and the delivery a bit impersonal whereas there was more interaction in the scripting workshop. In both the scripting workshop and a gift box building workshop there was humour which I find essential in any learning environment. I had the chance to talk to two instructors, Simon Kline and revochen Mayne, who I would like to thank very much for the extra time they spent with me to talk about their workshops and what they think are key factors for successful hands-on workshops. 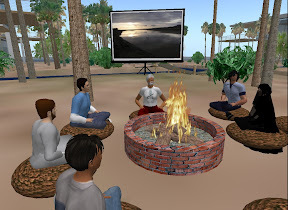 Second Life Educational tools – What is missing? I have been asked several times which tools I miss in Second Life. When I first started thinking about teaching in SL, I searched for some kind of whiteboard that I could write on because that is one of the most basic tools we teachers use in Real Life. Then, I started wondering whether I wouldn’t start teaching in a more traditional or at least RL way if I had a whiteboard. Why use Second Life if we teach there like we do in Real Life? I changed the way I think about teaching in SL and the tools I need. We only miss things if we have certain expectations. The expectations we have about teaching in SL often come from our RL experience. We have a whiteboard in RL and are used to using it so we want one in SL. Once I started seeing SL as a new tool itself and as a place that offers its own possibilities which often don’t exist in RL, I stopped missing tools and instead looked at what is there and how I can best make use of those tools. Some tools that are there, can also stand in one’s way instead of helping deliver a better lesson. SL educators have to ask themselves the same questions like educators in RL: “Do I use this technology/tool because it is there or does it really benefit my students and improve my lesson delivery?” I do have a large collection of SL educational tools. However, I have only used a handful in my classes, mainly a notecard/landmark giver, a notecard displayer, picture boards and a slide presenter. I might use a different set in a different course if need be but I have to justify it to myself. Having said that, I have found several whiteboard tools and mash-ups with websites where I can write and even draw on 🙂 but I don’t think I will make much use of them for now. In October 2008, I mentioned I would moderate an EVO sessions with other online colleagues (Dennis, Graham and Nick). Now, it is sign-up time. Follow this link for a description of the session and a sign-up link. The session starts on 12 January 2009 together with 17 other very interesting sessions. I’m looking very much forward to it. My building and scripting skills are still very basic and although I haven’t needed more sophisticated skills for my lessons so far, I do want to improve them. I tweeted about this assignment on Twitter in the hope to find others to help me brainstorm what kind of tree to build. Carol Rainbow replied and had some good suggestions. In the end, I decided to make an ice tree fitting the season 🙂 What I knew from the beginning is that I wanted to make my tree do something and not just a tree to be looked at. Again, because of the season and because of the ice tree, I decided it should recite a snow poem. It would be the first time for me to create the necessary sound files to upload to Second Life. I started building some crystals for “leaves” and was looking for a tree trunk that I could use. I wanted to change the texture to something that looked icy. Then, Carol joined me and she found a leafless, snow-covered tree in her inventory which was luckily modifiable and transferrable. I made several copies in different sizes of my crystal and attached them to the branches of the tree. I also added a snow emitter so that it snows. Meanwhile, I had given up on finding a good snow poem and decided it should be a winter song instead but I didn’t know how to overcome the 10-second limit (sound files uploaded to SL need to be under 10 seconds). I don’t have the rights to stream sound on the MUVEnation sim. Carol made my day by telling me about Psyke’s Music script that connects 9-second long sound files to a continuous sound. I was thrilled not only because this solved my song problem but also because this would be extremely useful for creating objects for my language lessons. I found a free version of my song, a very popular German song about a snow flake, Schneeflöckchen. The only drawback that the script has is that all the sound files need to be exactly 9 seconds long. I’m sure there is an easy (automatic) way of splitting a longer sound file into 9-second bits but I haven’t worked much with sound files, yet so that this took me ages. I uploaded my six 9-second sound files and dragged them onto my tree together with the script. Carol also showed me what to do to have the cursor turn into a hand indicating that this object does something when clicked on (write “Touch to play music” into the description field of the object in edit mode). So, now, I had an ice tree that snowed and played a song when clicked on 🙂 Thank you for all your help, Carol! Some days later, I felt like I didn’t really build a tree and wanted to create a second version from scratch. I used the same ice crystal and coloured them. The script is the same, too. My main problem when building is that aligning objects takes me incredibly long although I use camera control to look at my object from all angles and zoom in on my objects. I know I can use the grid but that wouldn’t help with objects like my tree. Whenever I added a crystal and thought it was positioned correctly on a branch and I looked at it from another angle, I saw that it was not where it should be at all. Another issue with this tree is that the number of prims I used is very high, which is something that good builders always try to avoid. Therefore, I am looking forward to the master builder session on the MUVEnation island which will take place soon. My trees and all the other trees built for this activity are located on the MUVEnation island (temporarily).